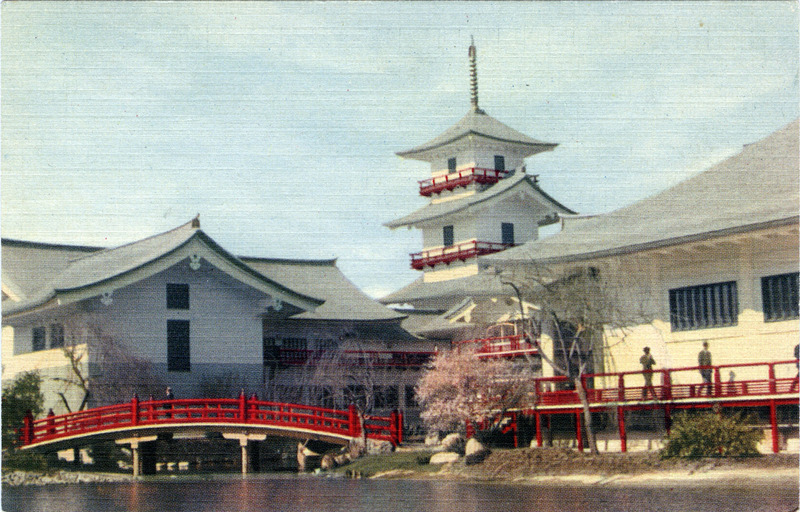 Japan Pavilion, New York World’s Fair, 1939. “Japan Pavilion, symbolized in this replica of a feudal castle, depicts its rich culture in a harmonious blend with its modern industrial arts and exhibits.” Exterior of Japan Pavilion, New York World’s Fair, 1939. “In New York, a ‘Flame of Friendship’ that had been lighted from ancient fires at the Grand Shrine at Izumo and carried a distance of eleven thousand miles to the fair by a photogenic ‘Miss Japan’ added a drama that was reported in the press at numerous points during the journey. In a carefully orchestrated publicity stunt, ‘scores of kimono-clad Japanese girls’ who tread ‘carefully in wooden-soled sandals to which they are no longer accustomed’ accompanied Miss Japan to the fair’s Court of Peace on the Japanese pavilion’s opening day. “… In New York, where the interior design was under the direction of Bauhaus-trained architect Iwao Yamawaki, there was an effort to create immersive environments through an integrated overall aesthetic. Japanese planners, impressed by the photographic displays European countries mounted at the 1937 Paris exposition, followed suit, making greater use of photography and monumentalized imagery. Photomurals depicting sites on the Japanese mainland by leading Japanese photographers and designers were a key design element. 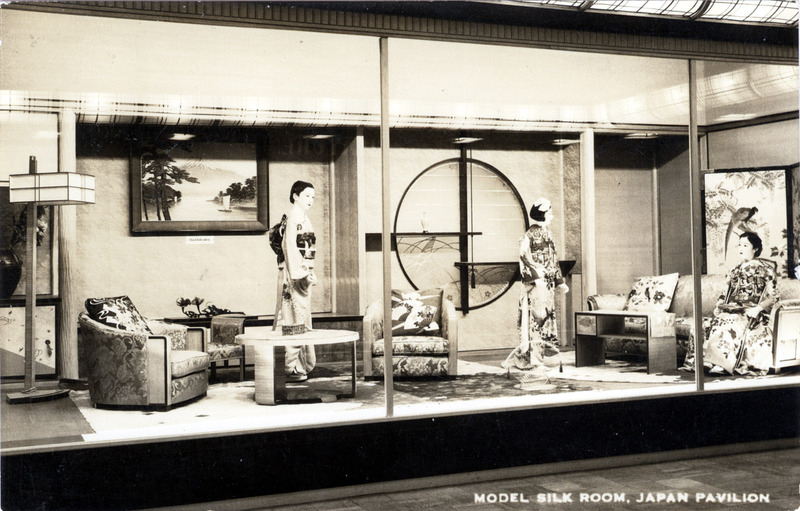 “Model Silk Room”, Japan Pavilion, New York World’s Fair, 1939. 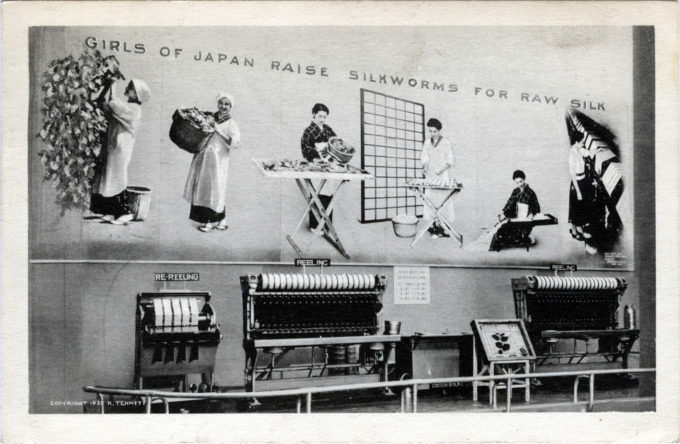 “Girls of Japan raise silkworms for raw silk”, Japan Pavilion, New York World’s Fair, 1939.